It's amazing what a couple of pretty place mats, fancy flatware and wine glasses will do to a meal (even when the wine glasses are only filled with soda pop from a can). Grilled Chicken Breasts marinaded in Kraft's Sun-Dried Tomato Dressing & Marinade - I have been very pleasantly surprised at how good this is. 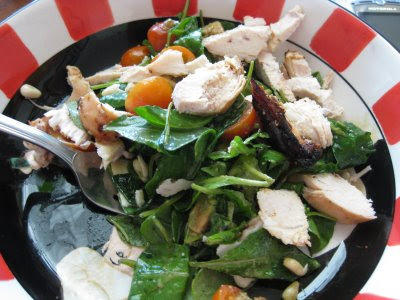 Arugula Salad - a new-found favorite. We gobbled up the vegetables, massacred one chicken breast (but were too full to start on the other) and ate about half of the salad (growing up feeding an army still wreaks havoc with my appropriate portions calculator). So today for lunch we had Dinner Take II. Combine ingredients (except avocado) in a bowl with a lid. Cover and shake. Divide onto 4 plates and top with avocado. Easy!